Get your lunch and yourself to the county building plaza (the shady part) for this Free summer music treat in downtown Muncie. It'll perk up your Thursday work routine almost like a jalapeno hidden in your sandwich! Rescheduled from rainy June 21 for tonight, June 28, 6:30 pm, with NO Stormy Weather on the program. 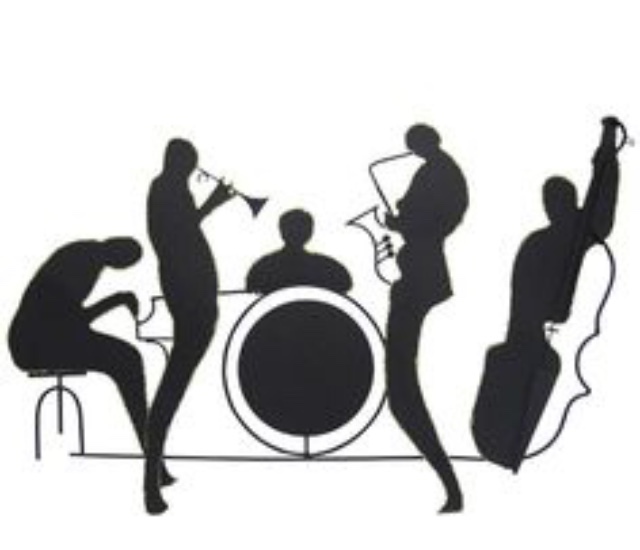 Prepare to swoon, as the Jazz Band musicians of America’s Hometown Band celebrate the “Crooners”. The music of voice artists such as Bobby Darin, Michael Buble, Dean Martin, Harry Connick Jr — are recreated by guest vocalist Myles Ogea, with this ‘Big Band‘ from AHB. 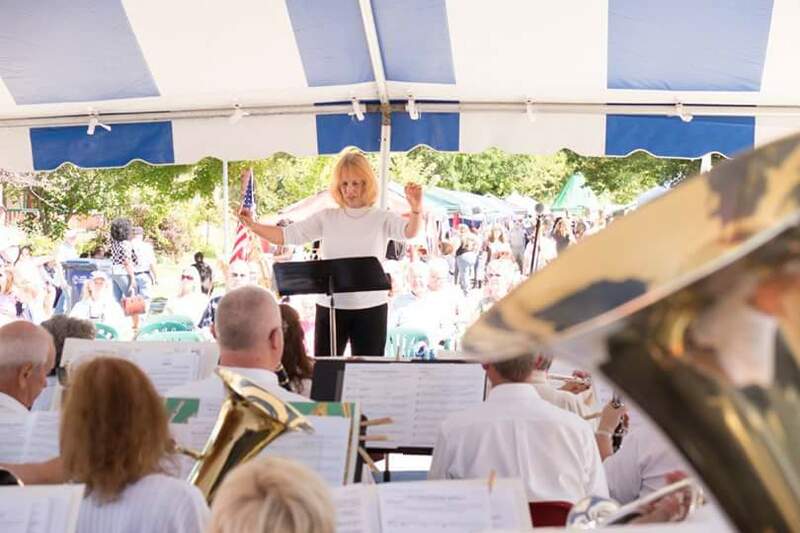 This Free outdoor concert from Your AHB full concert band, presents an eclectic mix of fun summer music for all ages. 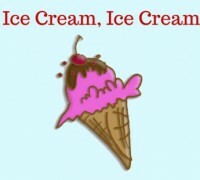 Meet & Greet friends over a dish of ice cream (nominal cost), at this fun annual event. 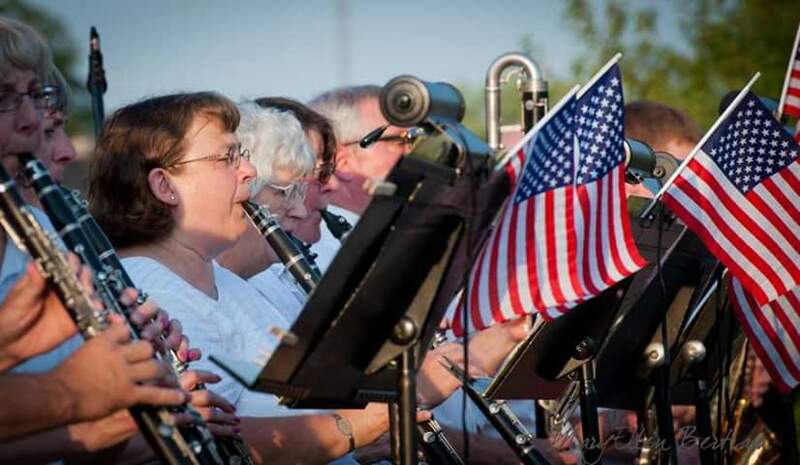 Free "Concert in the Park" with America's Hometown Band	7pm	@ Westside Park	S. Celia Ave. and W. White River Blvd. AHB at Westside Park - free - Aug 9, 7 pm. The full concert band,, with featured soloists on xylophone, flute, cornet, and voice, entertain with a variety program of familiar hum-along tunes. Enjoy the sweet summer sounds of this outdoor concert from your own lawn seating, with family & friends. 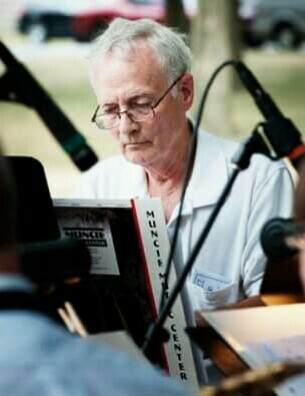 "Meet Me on Broadway" Big Band Jazz Concert from America's Hometown Band	6:30pm	@ E.B. and Bertha C. Ball Center	Outdoors	400 N. Minnetrista Blvd. 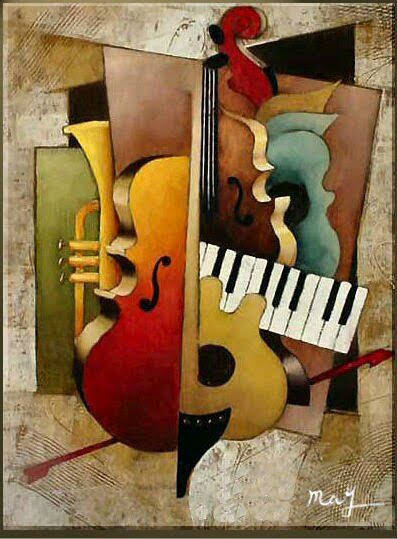 Everyone is invited to take in this Free Big Band Jazz concert, performed by top talents from America’s Hometown Band. “Meet Me on Broadway” echoes the tunes of the best in musical theatre – great composers like Jerome Kern, the Gershwins, John Kander, Harold Arlen, Cole Porter. Bring the lawn seating, and get ready to enjoy a very special evening in your home town. 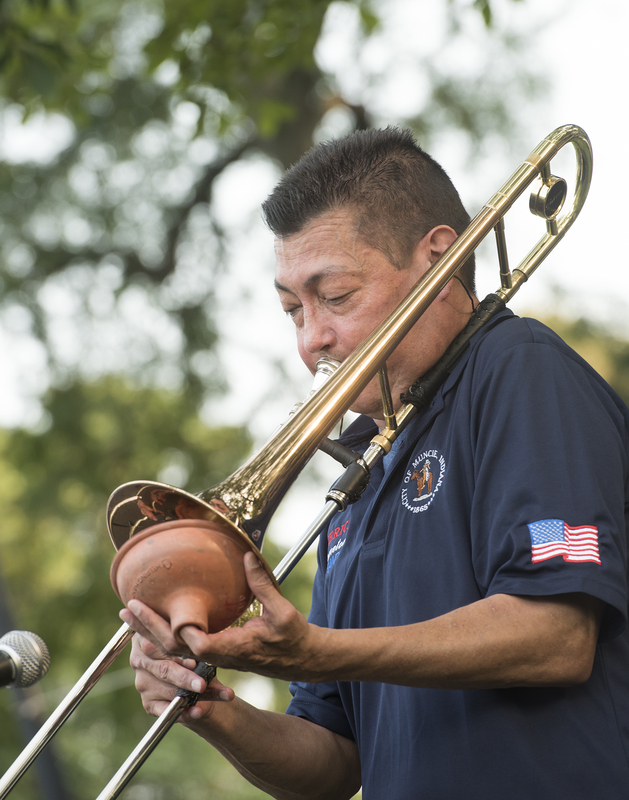 AHB brings festive tunes to Washington St. 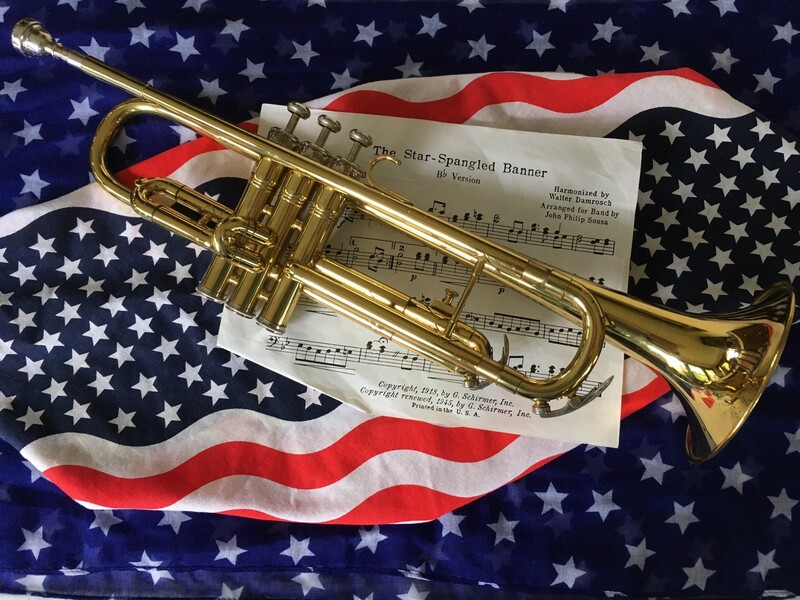 This Free Concert Band program of fun summer music starts at 2:00 pm. Free seating is provided at the Festival Performance Tent, and the public is invited to attend. The outdoor Performance Tent is situated at the crossing of E. Washington & Monroe Streets in Muncie. AHB music is always a special treat with your Vera Mae's dinner! And only in your Hometown, Muncie. Sunday Afternoon Jazz - America's Hometown Band	5:30pm	@ Pruis Hall	Ball State University	Off N. McKinley Ave, between Bracken Library south door and the back of Emens Aud. 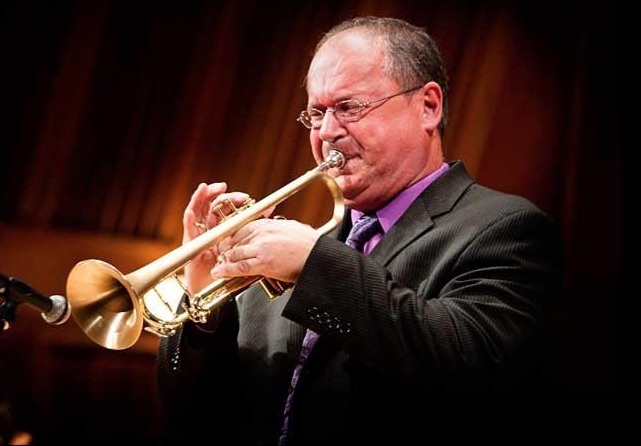 Spotlighted guest is Mark Buselli, featured on trumpet, who is a well-known arranger & performer in Big Band/Jazz circles. He also heads up the Jazz Studies program at BSU. This program blends in a strong touch of Buselli's style and musical gusto, for quite the entertaining afternoon. 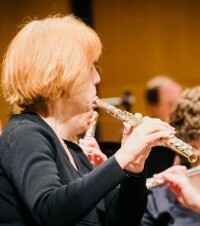 Flute Choir leader, Rachel Eldridge. 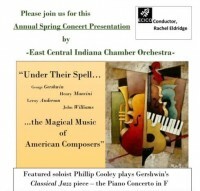 AHB'S Central Indiana Flute Choir concert is always a Must-Hear event! 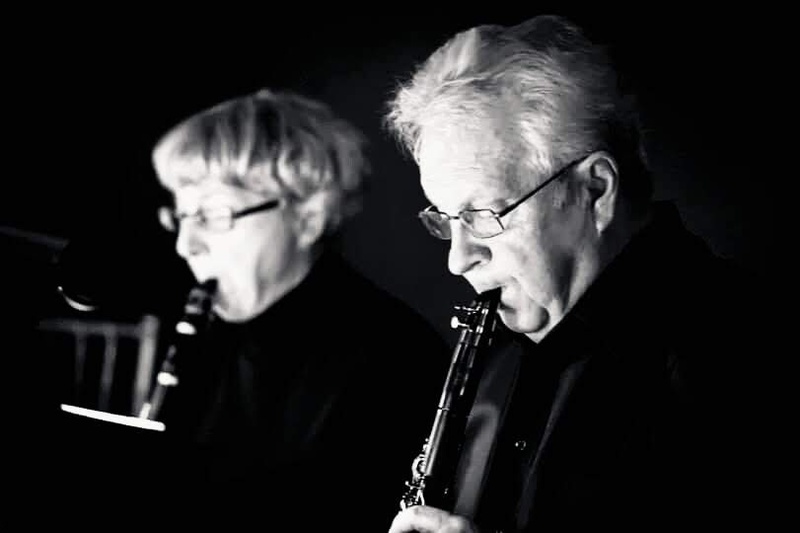 Experience this group's ethereal harmonies, and you will learn just what a fine, fine flute choir should sound like .... Precise & Lovely. 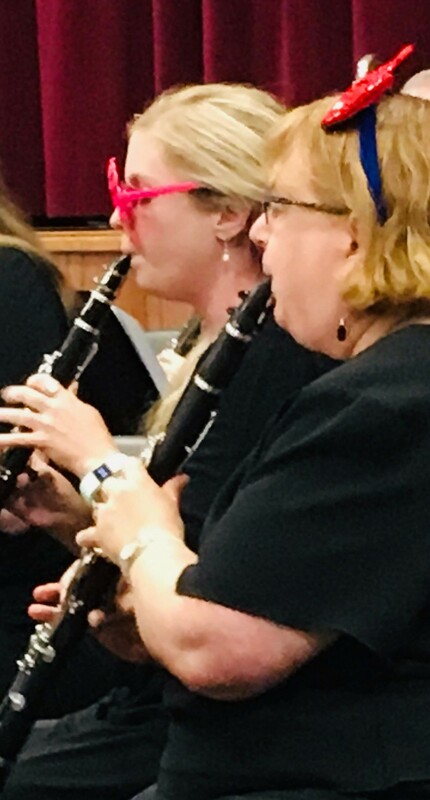 The program music is fun & familiar to the season, performed in choir voice ranges -- from the tiny piccolo (high soprano), to the 3ft-long, bent-pipe bass flute ( low voice). 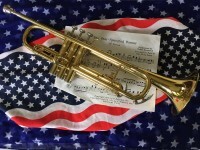 America's Hometown Band again sends a Trombone Quartet to perform as part of the outdoor ceremony for Veterans Day, at the cemetery. 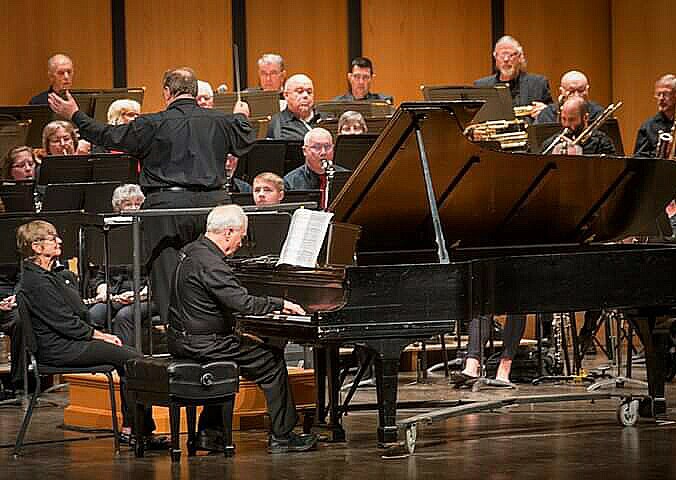 "The Many Lives of Classical Themes"
This concert explores how symphonic tunes really are familiar to everyone! Join this music trivia trail through film, cartoons, advertising, and more, with Conductor Rachel Eldridge, and the ensemble musicians of East Central Indiana Chamber Orchestra. 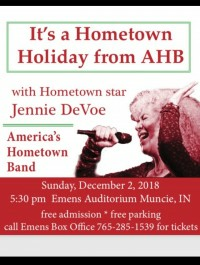 Muncie' s own Hometown singing star - Jennie DeVoe - is bringing her music home for the Holidays this year. 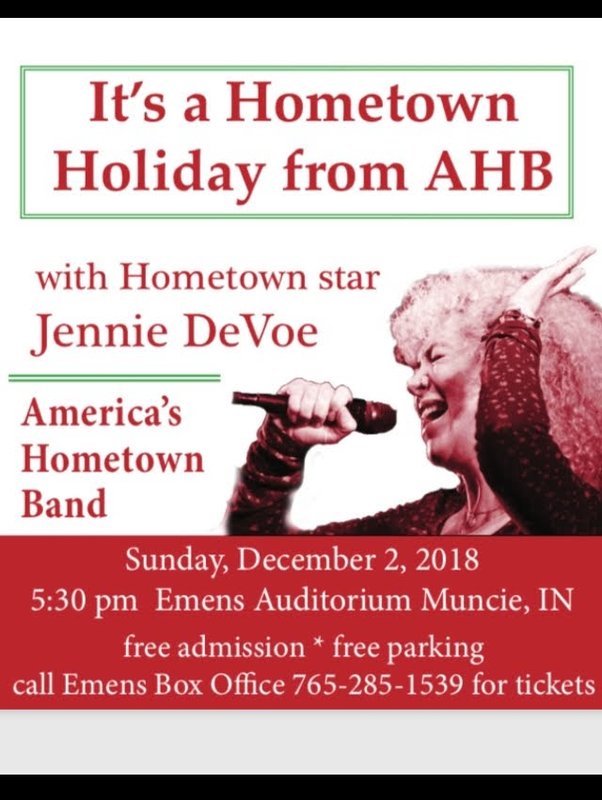 She is being hosted by Muncie's own America's Hometown Band, together on stage at the Ball State University Emens Auditorium. And it's all FREE. Bring the family. Get your Free Admission tickets through the Emens Box Office -- 765-284-1539. Free Parking in BSU carparks. This is BIG. Tuba-sized Big! 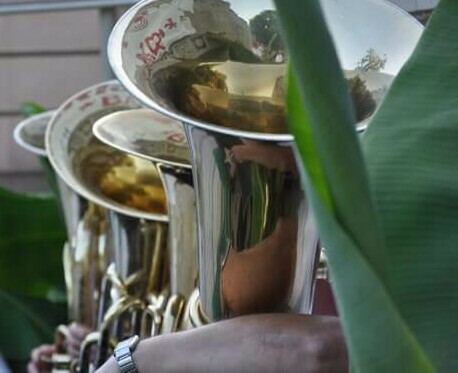 TubaChristmas is a tradition shared in countries the world over. 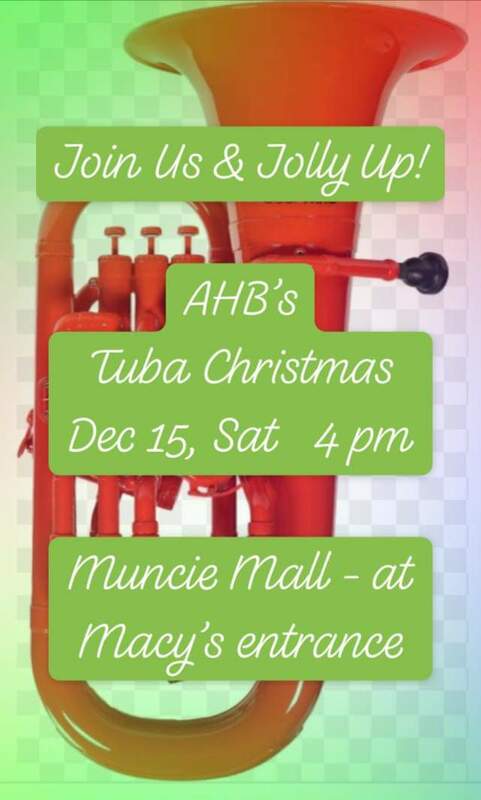 It's when tuba (& other low brass) players get together to create and share Christmas tunes with the holiday crowd - wherever they are. 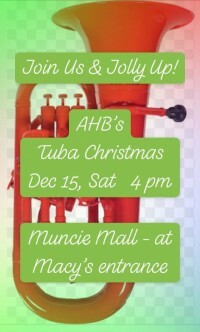 In Muncie, this Christmas-only group is sponsored yearly by America's Hometown Band musicians. Don't miss out! AHB 31st Anniversary Concert & Soloists on the Emens stage. 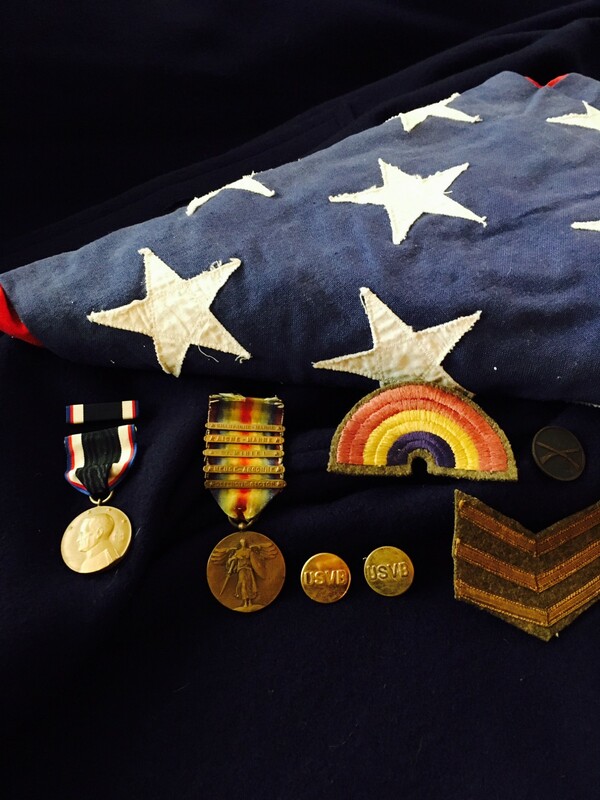 It's all about celebrating some of the very best about Muncie. In honor of AHB's 31st year of providing free public music in Muncie, this event opens the 2019 season by presenting outstanding local soloists and conductors in concert at Emens, including three world-premiere pieces of music. Star soloists are Phil Cooley, Lisa Kozenko, Rachel Eldridge, Patrick Stauffer, and George Wolfe. Guest conductor is Caroline Hand.